So this is Christmas...and what have you done? This month has gone so fast. My husband has been out of town all month. Literally. He's come home for the weekends, and then back out to Pittsburgh for the remainder of the month. Our time together this month has been spent over the FaceTime screen or on the phone, OR on whirlwind "buy everything you can as quickly as you can" Christmas shopping trips. To say I am tired, would be a mere drop in the bucket to what I'm really actually feeling. Everything I've done this month, I've done alone. He can't help this, of course. It's training for his new job- the job that pays better and has better hours than the last two jobs. In short- this is a really really good long term thing, after a pretty crappy short term thing. I've tried really hard not to get caught up in the hustle and bustle of the season. With Andy out of retail, I didn't even visit the mall this season. There was no mall Santa for Liam to pose with. We went to our little hometown Santa on a whim, actually. There were no trips to see Christmas lights- although we did go to Messicks Farm Supply to watch their "mighty machine lights" about 5 times. I've tried really hard to make the season special for Liam. 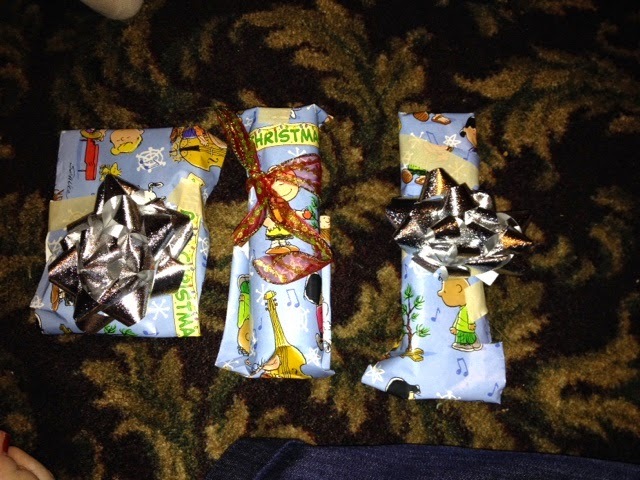 We wrapped his gifts for his grandparents together- using masking tape instead of scotch tape, because his fingers were too small. And after he had placed the bow gently on top of his daddy's gifts (that he painstakingly picked out at HomeGoods...) he looked up at me with his little cherubic face and said, "Daddy be SO HAPPY for Christmastime." Oh my goodness, I'm crying right now typing this. If you could only see those gifts. He picked a pack of bag clips that look like owls, a kaleidoscope from the toy department, and a pack of Reeses peanut butter cups. A two-year-old's bounty. Daddy be SO HAPPY for Christmastime. On Sunday morning, our great friend Linda found her husband face down on the floor of the bathroom. He had apparently died during the night and she found him in the morning. She came to church. Hours after watching her husband be zipped into a bag and hauled off, she came to church. Nobody could believe it. Nobody knew what to do with her. It was like she had the plague. People I think were actually angry at her for coming. But what people don't see is that she has nobody but her husband. Linda is the epitome of a "people person." And the church is her family. She and Alan were always the first ones there, last ones to leave, seen with a rag and bucket cleaning up tables after socializing, bidding on items at auction fundraisers. I mean- just everywhere. So where do you go after you suffer a loss? To love on your family. It makes sense. None of my gifts are wrapped. I threw some of them in bags last night as I was trying to clean up, put Liam to bed (he finally gave up at 12:30, and then was up many times during the night). This Christmas movie I'm trying desperately to make is not formatting correctly. There's not enough room on the computer for this movie. I'm frustrated with it. The excitement I had for it is gone, now knowing that I have a few hours to figure something out, after I've been trying to "figure something out" for literally 48 hours now. I downloaded $40 of new software to make it work. Wasted two dual layer disks (at $45 a pack). It's costing me time and money I don't have. Tonight we're having an annual Christmas Eve party. We have one every year. Just a few friends, mostly far extended family. Ten or so people tops. Except for this year when I'm planning on 25. And I've done it all myself. With a broken vacuum. And a toddler. My inlaws are coming down directly after Christmas, so somewhere in the scuttle, I need to erect two air mattresses, complete with bedding. Come up with some sort of food list. Make two lasagnas for another Christmas celebration the evening of our dear friend Alan's funeral. And I have an MRI on Friday. Don't forget that MRI. Because at the end of the year, my insurance is being dropped by all my doctors. I'm missing it. Big time. And as I'm trying to stop and relax and pretend I don't care if stuff doesn't get done, I realize that I'm getting MORE anxious because stuff isn't getting done. Our work Christmas party is now my baby, because they fired the girl who normally did it (thank GOODNESS. Highlight of my year!) But it is also causing me anxiety because the people I work with are ungrateful. But for my sweet little boy- Christmas is just happening all around him. To him it's magical and wonderful. He's excited to give the gifts he's wrapped. He's excited about the prospect of Ho Ho, ascending from the heavens and bestowing gifts on him in some unimaginable way. I think I'm realizing that I've been so frantic to get all this stuff done and maintain normalcy because I know how important Christmas is to a child. And I'm Santa now. I don't ever want him to know about the hustle and bustle and stress and anxiety surrounding this holiday, because I'm realizing now that I NEVER knew about it growing up. What more is Christmas about? Than a little baby boy coming to save us from our sins, and a little baby boy wrapping gifts 2000 years later to give his sweet daddy. A daddy who has been taken away for a month, to make a better life for his family. A man and his wife, traveling to Bethlehem to make a better life for their family. Daddy be SO HAPPY. For Christmastime.